Locate all the 2018 Halloween haunted houses in Indiana at Funtober. We list all the haunted attractions including haunted trails, haunted houses, haunted corn mazes, and more in our Funtober directory of haunted houses. The Midwest has lots are scary entertainment featuring animatronics, air blasters, Hollywood type design sets, live actors, and scent dispensers. Find haunts with ghosts, zombies, creatures, with Jason’s and Freddy’s making for Halloween scary fun. Sorry folks but due to weather damage Amhurst Asylum has closed for 2018. Open most nights beginning September 27th through November 11th. All new redesigned attraction this year. Deimos Nosferato has been the keeper of souls for centuries and has awakened his tribe of creatures and vamps from the underworld…because it’s time to feed. Many have tried to end Deimos and his blood thirsty family and all have failed.They have a number of ticket options including a coffin ride, VIP pass, and Double Trouble. Attraction first opened in 1985. Celebrate this anniversary with some deranged dentists, paranormal entities, undead monsters, evil cults, and a dark carnival. Tickets available for Culbertson Mansion Haunted House. The attractions runs on Friday and Saturday nights starting October 5th. Doors open at 7 pm. A real historic site once home to Indiana’s richest man. Open starting September 29th. Weitle’s Asylum haunted house is about tortured souls of the deranged doctor. What horrors were committed in the name of science? Tickets are $12. Edge of Insanity runs from 8 pm to 11 pm. Open every Saturday and Sunday nights in October. Over 15,000 square feet of terror located in Lafayette. One giant haunted house with nightly frights for your fun. Open Friday and Saturday nights starting October 5th. The fear begins on September 28th this year. Fear Fair Haunted House is more than just scary. It has been rated one of the best haunted houses in Indiana. Here the actors (monsters) can and will touch you. They find what scares you and takes that fear or phobia to the extreme. You will be scared. Tickets are just $20. Doors are open from 8 pm to 1 am on every Friday and Saturday or 10 pm on every Sunday night. The haunt features Myctophobia (Fear of Darkness), Hanger 17, and Cinema of Fear. Fear Fair is more than just fun. Make sure to view the Fear Cam. The attractions are Lost in the Woods, Rock Monkey Caves, Sinister Circus, Cucko’s Nest, and 13th Hour. They are open Friday, Saturday and Sunday nights starting September 28th. Fear Itself at Legend Park features several of the Scariest and Best Haunted Houses in America… all in one location. With 5 huge haunted attractions, an amazing Monster Midway, Exceptional Food, Beer & Wine Garden, Bonfires, Live Entertainment, Tent Parties, Celebrity Appearances, Live Bands, Fireworks and a complete line up of FUN THINGS TO DO, Fear Itself at Legend Park is Indiana. Eighth year for this local haunt called Manchester Manor. Open every Friday and Saturday night in October. Doors open at 8:00 pm and runs until 11:00 pm. Everyone with a ticket will get to go through the attraction before they close for the night. A haunted school put on by the Hall Civic Association. Open every Friday and Saturday nights in October. Season starts October 5th. Tickets are $15. The combo pass is a one time entry into all five attractions. The hayride, maze, and 4 haunted houses at Hanna’s Haunted Acres. Attraction is open starting September 28th on every Friday and Saturday night plus all most every date in October. Save money and buy it for less online. Opens for ticket sales 30-60 minutes before dark. New this year is the renovated Hanna Haunted Hayride. Also an upgrade to the classic saw. They have added two new attractions called Carn Evil and Outbreak. 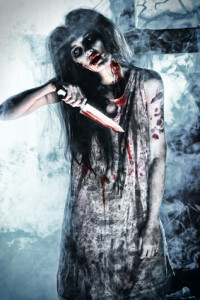 Expect to find creatures, Dracula, zombies, snakes, chainsaws, a scary maze, clowns, and demented dentists and doctors. There are a number of ticket options for one or two attractions or other combinations. Prices are low for Scarecrow’s Revenge but check their website for dates and prices. Halloween season kicks off on September 22nd. The Theme Park Holiday World is decorated for Halloween with hayrides, a 3D Theater presentation, Halloween candy, pumpkins, a Mummy’s Treasure Maze, and stage shows including Graveyard Smash. During Saturday and Sunday afternoons they feature a costume dance party hosted by Kitty Claws. On Saturday nights they close at 8 pm with a Halloween themed laser light show. Since they are open Saturday’s past sundown, they also feature coaster rides in the dark. Halloween ticket prices online (in advance) are discounted. This may be one of the best Halloween party values around. A charity haunt that raises funds for Cerebral Palsy Group. Started in 2012 this is now an annual event that runs rain or shine. They are open weekends beginning late September through October plus some other dates. Check their web page for their full schedule. Tickets are $22. The Haunted Castle opens September 21st. Open Friday and Saturday nights in September and Thursday through Sunday nights in October. Also know as Black Forest Haunted Castle. Ticket price is $10 for Haunted Castle, $10 for Black Forest, or $16 for a combo package. Door are open at 7 pm. They are sponsored by the Saint Vincent Boy Scouts. Check their web page for complete schedule of open dates. They have been putting on this event for 38 years. This is an outdoor haunt winding through the woods along Beckett’s Run Creek. Open weekends beginning October 11th. Headless Horseman Hay Ride is part of the Conner Prairie history park. The haunted attraction runs Thursday through Sunday nights in October. Lots of fun loving ghouls on this ride. Save some money and order tickets online for less. Guests are invited to wear their costumes this year. Their daytime hay ride is for the entire family and runs from 10 am to 5 pm. Attraction opens September 28th. Kind of an overlooked haunt with lots of evil energy. A full 20,000 square foot professional commercial haunt with all the actors, animatronics, etc. They are open Thursday, Friday, Saturday, and Sunday nights in October. The scare begins at 6:45 PM. Three attractions priced have a combo price. See web page for details. An escape room adventure open every Friday and Saturday nights from late September 21st. New this year on Thursday Nov 1 from 7-10pm is FULL CONTACT. You asked for it and will need to be 18+ years old, sign a waiver, and be ready to be touched, hooded, or separated. ONE night only and tickets are selling already, get yours online before it is sold out because tickets and time are limited. The fear begins starting September 28th. Fear Farm is a great haunted attraction. Ticket are $15 for the Haunted Hayride featuring 50 actors and a mysterious scary headless horseman. Tickets are $13 for the Slaughter Barn that features 40 actors as you crawl and climb to escape with your life. Wear clothes you do not mind getting dirty. You can get a combo ticket for both haunts for just $24. Fear Farm is open every Thursday, Friday, Saturday and Sunday in October. Sunday times are 7 pm to 10 pm. Friday and Saturday times are 7 pm to 11 pm. The screams begin September 15th. There are six haunted houses at the Indy Scream Park. It has a great monster midway with food, games, live entertainment, beer, drinks, and a fire pit. New this year is the attraction Kilgores Circus. It is open weekends in late September and every night in October after the 4th plus a few November dates. Backwoods is a half mile wooded horror trail. Bedlam 3D has 3D crazed clowns. Infected is an infected corn maze. Kuraymi is about demons in the dark. Nachtmahr has 6000 square feet of animatronics and 30 actors. Indy Scream Park is a lot of fun starting at $19.95 depending on the night you attend. Doors open at 7 pm. Indy Scream Park has over 68000 Facebook likes. Opens September 28th. Now helping charities for more than 45 years the Zombie Farm has a new outdoor maze and town. This is one of the most intense, creative, and visually appealing attractions in the state. Over 50 live action actors bring the scares to you.Tickets are $12. Doors open at 7 pm. They also have a non scare tour starting at 6:00 pm. Attraction runs Thursday, Friday, Saturday, and Sunday nights in October. 40th annual. Voted the scariest haunt in Indiana last year by the Scare Factor Reviews. Enjoy the only full contact haunt in Indy, where guests can face their own mortality in three features, including a few with outdoor scenes, and your ticket gets you into all of them! $25/VIP is $40 (guarantees half the wait at the head of the line). The escape room, Escape the Nightmare, is $5 per person – a custom built experience where your team of four has to escape an art gallery while finding a cure for the infected gallery curator in order to prevent the zombie apocalypse. Nightmare on Edgewood supports local community organizations including Haunters Against Hate. Opens starting September 28th. Olde Courthouse Catacombs and The House of Lecter have joined forces this year to put on Curse of the VooDoo Queen. Two locations for one low price. These are two separate nearby haunted houses. They are one block from each other. Advertised as Let’s Play you can buy a combo ticket to get into both. They are open Friday and Saturday nights from 7:00 pm to midnight or 10:00 pm on other nights. Open season on September 22nd. Reaper’s Realm has 3 haunts including Reaper’s Mansion (haunted house) and Reaper’s Woods. Get the combo price plus a carnival ride. Doors open at 7 pm. Attraction runs Friday, Saturday, and Sunday nights starting October 12th. Prices can vary depending on the night. This haunt has been operating for over 25 years. An intense scare awaits adults who enter. Scarevania has been running for over 10 years. Besides an evil haunted house. The blood will fly as live acts perform and entertain on their carnivale cabaret stage. Open every Friday and Saturday night in October. This is their 9th year. Attraction opens September 28th and runs every Friday and Saturday nights in October. Check web page for additional dates. This is an award winning zombie type attraction. Asylum House has a full evening of scary entertainment for you. Opens for the season on October 5th. Open every Friday and Saturday nights plus lots of Thursdays and Sunday nights. Check web page for details. The times are Friday and Saturday from 7 pm to midnight. During the week it is open 7 pm to 10 pm. Asylum House has lots of entertainment haunts named Morningwood Cemetery, Crypt of Elysium, The Shadow Realm, ScreamNhaller, AliveNpsycholand, Alien Mansion, and Lost Highway. Tour the cages and caverns with monsters, death, despair and creatures galore. The fun starts October 5th. Children’s Museum has been putting on an annual haunted house since the early 60’s. Now celebrating over 55 years of haunting. Open October 11th through the 31st. Lace up your sneakers for a visit to a truly terrifying gymnasium—Grim-nasium! Starting Oct. 11, The Children’s Museum Guild’s 55th Annual Haunted House will give you a courtside seat to witness all the action in this monster-filled gym. Cheer on your favorite phantom, but keep your eyes open—scary surprises lurk in the bleachers! The Haunted House offers IPL’s Lights-On Hours (for children who scare easily) and AAA’s Frightening Hours (with the lights off, for children who dare to be scared). Sorry folks but this attraction has closed. If you live near Chicago, or near the border of another state, it is worth taking a quick peek at the haunted houses of the other state in addition to the Indiana haunted houses. Have you bought a ticket to one of these haunted attractions? I would love to hear what you thought. Did you have fun? Was it worth the price? Would you recommend it to others? Any suggestions to maximize the experience? I’ll gladly publish what you send me and give you a super dooper hug.